I made these for a craft show last December, and they sold out! I’m still making more for special orders. This quick crochet project would be perfect for an Easter basket. These puppets are crocheted in continuous rounds. Use a stitch marker to help you keep track if necessary. Rounds 3-9: sc into each stitch (10 sc). Finish off and leave tail to be worked into the rounds of blue that are coming next. Blue yarn: Bring up a loop through the last yellow stitch and continue to sc in each stitch for three more rounds. Fasten off and weave in ends. White yarn: 7 hdc into magic ring. Join with a slip stitch. Grey yarn: Pull up a loop, then 2 sc in each stitch around the white circle. Join at the end with a slip stitch, then chain until you have a long enough chain to wrap around the puppet’s head. Join to the other side of the eye using a slip stitch. See below for finishing instructions. Rounds 3-7: sc into each stitch (14 sc). Blue yarn: Bring up a loop through the last yellow stitch and continue to sc in each stitch for two more rounds. Fasten off and weave in ends. White yarn: 5 (very tight) sc into magic ring. Join with a slip stitch. Repeat process for second eye. Grey yarn: Pull up a stitch on one of the white circles, then crochet almost all the way around – 2 sc in each stitch. With one white stitch remaining, hold the second white circle next to the first and keep crocheting around the second circle. Join at the end with a slip stitch, leave a very long tail. Use a yarn needle to work the very long tail through several stitches until it pokes out of the side, then chain until you have a long enough chain to wrap around the puppet’s head. Join to the other side of the eye using a slip stitch. Finish off and weave in ends. Position the goggles where you want them to go on the puppet’s face. Using black embroidery thread and needle, stitch black pupils into the eyes (which will hold the goggles in place) and create a mouth below. Optional: use grey thread to stitch the goggles to the body to make the puppet a little more sturdy. 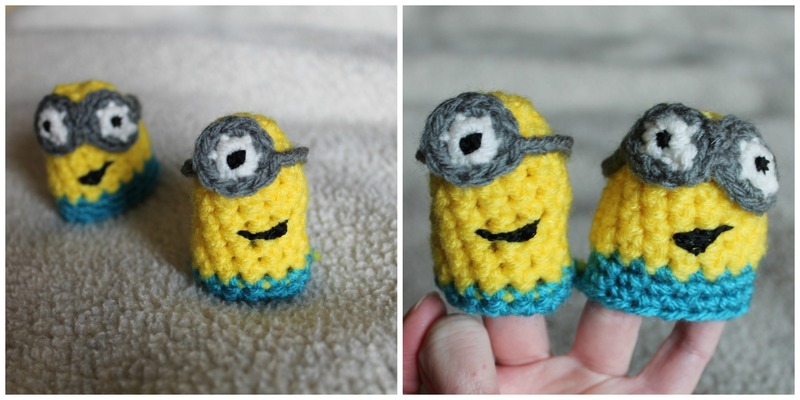 This entry was posted in General, Gifts, Kids Activities and tagged crochet, Despicable Me, finger puppet, minion, puppet, toy by The Reluctant Hippie. Bookmark the permalink.